Check out this fun gadget, the Piggy Loudspeaker. 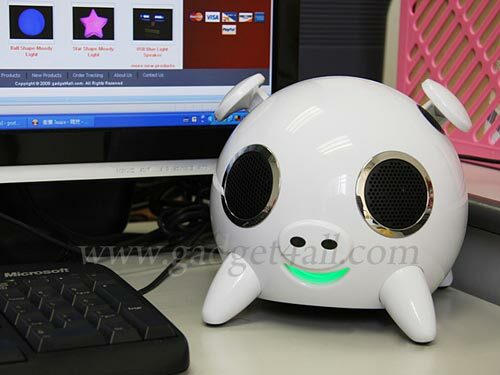 Piggy speaker with cutie piggy design and super high quality of sound lets you enjoy your favorite music freely!! Speakers are designed on its eyes, ears and at the bottom of the body. With the sensation technology, you can adjust the volume by gently touching its ears. Just connect it to your PC, MP3, MP4, iPod, etc, and enjoy it! The Piggy Loudspeaker is available to buy online for $105 from Gadget4all.